One of the things I enjoy most about Polish Pickup is seeing how different makers interpret the month’s theme. 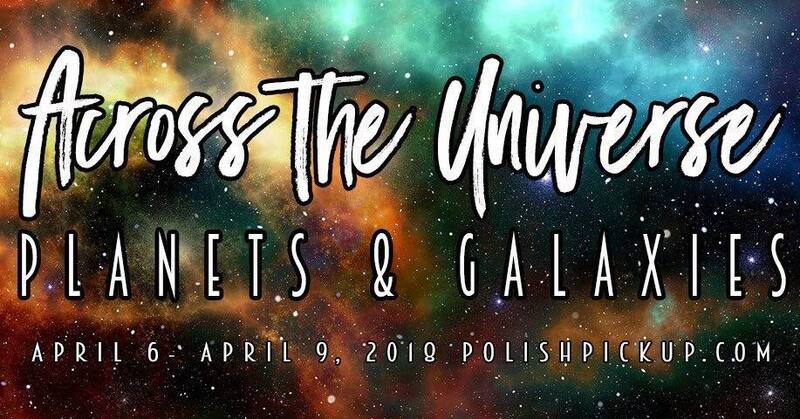 With April’s theme being “Across the Universe – Planets & Galaxies”, we’re seeing so many outstanding creations inspired by the immeasurable skies above us. We also have makers like Sacha of Jior Couture, taking inspiration from the fearless, red-headed, green-skinned, dangerous Guardian of the Galaxies, Gamora. Now, before I get too hyped and proceed into Avengers: Infinity Wars theories where we meet her ugly daddy, let’s catch up on what Polish Pickup is all about! 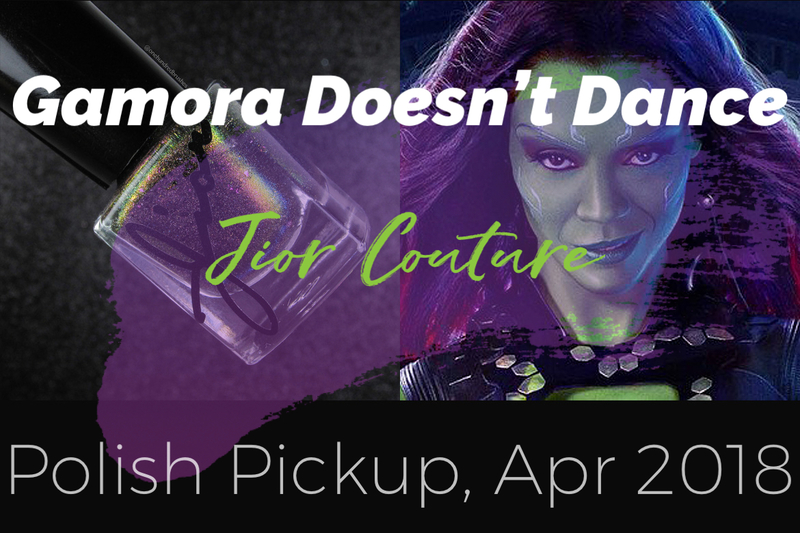 You don’t have to know anything about Gamora to fall in love with Jior Couture’s “Gamora Doesn’t Dance”. If it helps, I can tell you that she’s an alien, known as one of the deadliest women in the (Marvel Comics) Galaxy, comes from a dysfunctional family and is the last of her kind. Since joining the Guardians, Gamora has found a family and is slowly warming up to the idea of love. 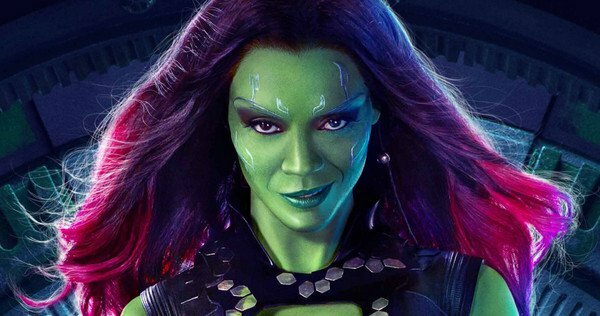 Believe me, I can go on; I haven’t even touched on Zoe Saldana who plays Gamora in the live action films! Let’s get on, shall we! 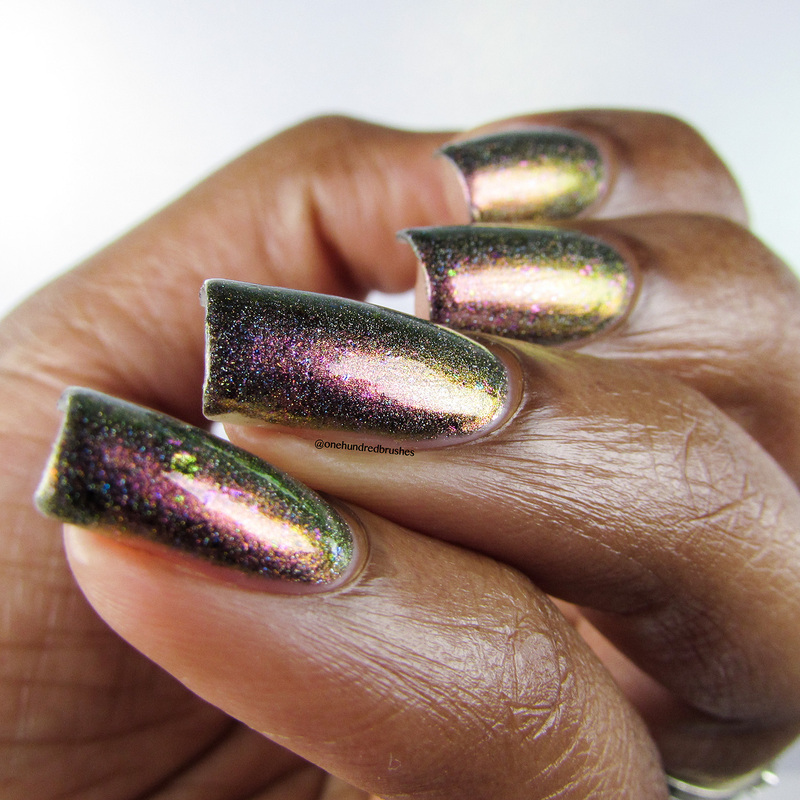 Gamora Doesn’t Dance is an unapologetic holographic multichrome, shifting from gold to green to pink to purple. 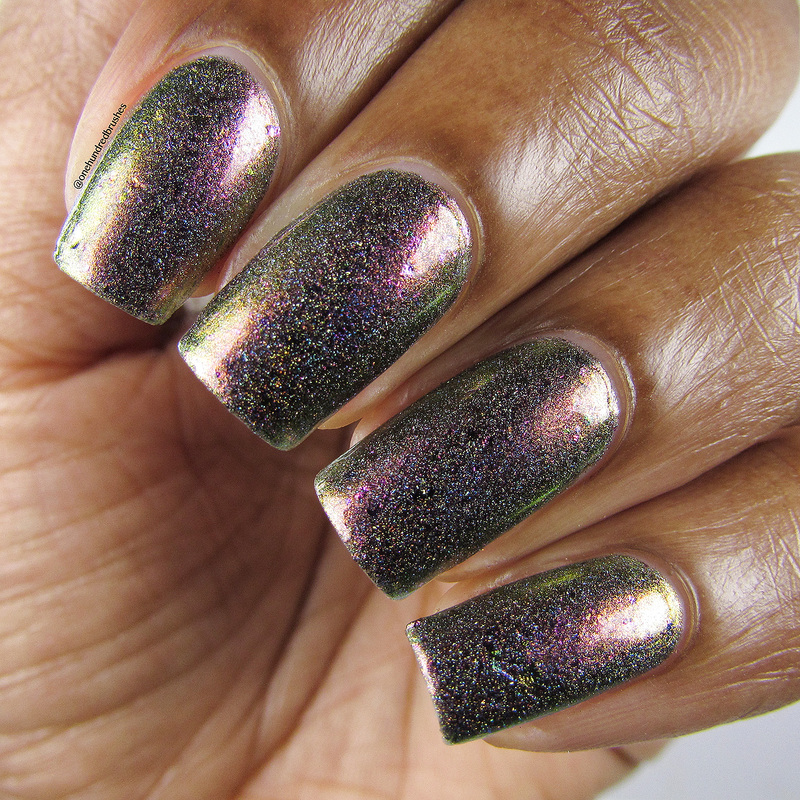 Sprinkled in are small and medium-sized holographic flakes. The flakes are nicely mixed in and apply easily with the consistency of the polish. The first coat is pretty light but after the second to third coat, it builds up very well. You can also wear this over black for a quicker, more intense shade. 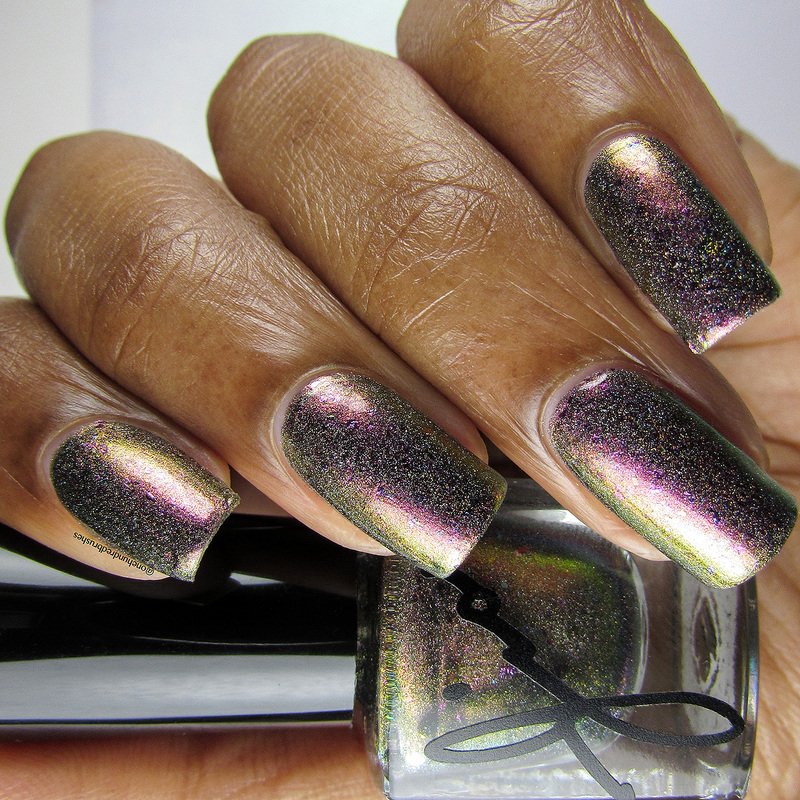 Here, I’m wearing two to three coats with a glossy top coat. The bottle shown in my pictures is a smaller size just for swatches. When purchased, buyers will receive a larger 12ml sized bottle. Keep in touch with Jior Couture by joining their Facebook group, Jior Couture Polish Mavens! 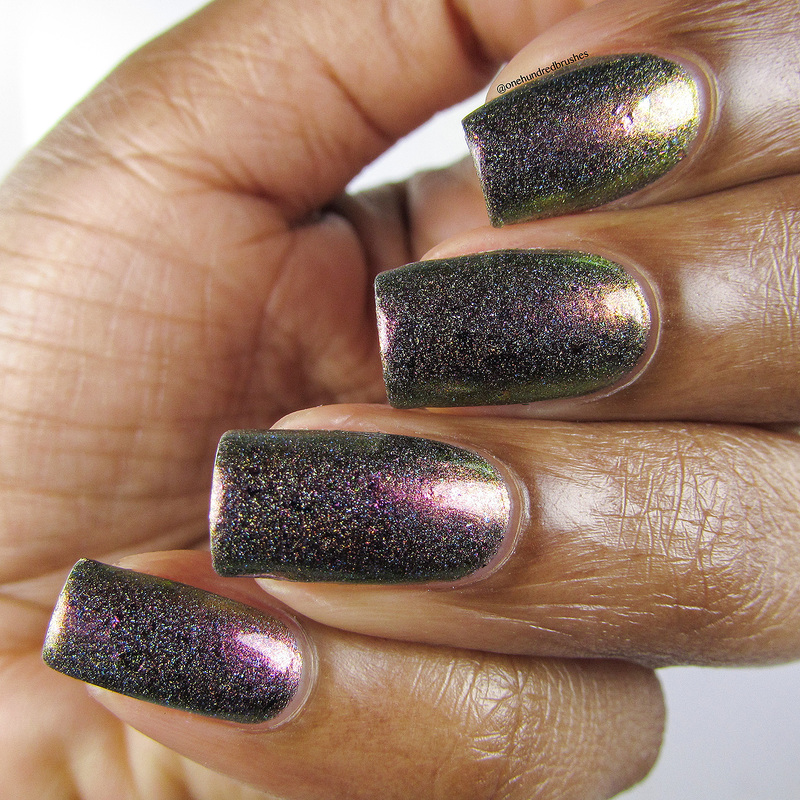 For live swatches of Sacha’s and other polishes and products available this round of Polish Pickup, don’t miss Delanie of Fat Cat Pawlished’s live swatch events on Facebook! 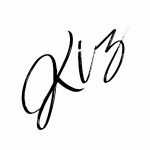 I’m late to your blog party but I won’t be leaving. I’ll be that last annoying guest you have to pry out of the corner of your apartment. Great job! 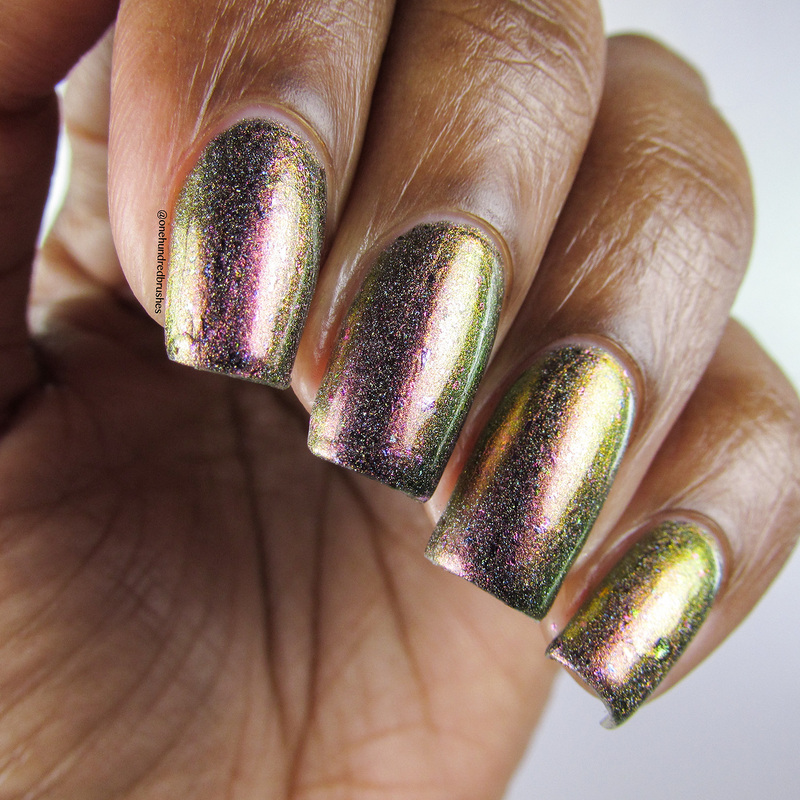 And this polish is stunning! Bahaha! Trust you to have me cracking up! The last ones to leave are the ones who feel right at home ? It’s so nicely done and inviting. It feels like going to a friend’s home, kicking off your shoes, jumping on the couch with a drink and snacks and catching up on chat! I love it! Second, thank you for the great review of Gamora Doesn’t Dance!